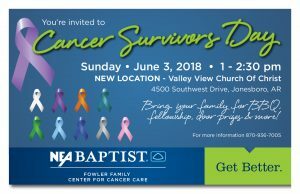 Jonesboro, Ark., May 21, 2018 – On Sunday, June 3 2018, NEA Baptist will honor and celebrate local cancer survivors as part of National Cancer Survivors Day, a tradition that is 31 years strong across the nation. A celebration for survivors and their families will take place from 1 pm – 2:30 pm at the Valley View Church of Christ (4500 Southwest Drive, Jonesboro). The celebration is open to all cancer survivors and their loved ones. Survivors and their families will enjoy a fun afternoon including a complimentary BBQ lunch, door prizes, and fellowship as they meet other families and survivors who have also dealt with cancer in their lives. It is a great opportunity to celebrate the hurdles they have overcome from the moment of diagnosis through treatment and beyond. It also serves as a resource for families to discuss milestones through the various stages of survivorship and to share encouraging experiences with one another. All survivors are encouraged to attend regardless of where they received their medical care – no RSVP’s are required. Call 936-7005 if you have any questions or need more information. The NEA Baptist Fowler Family Center for Cancer Care is a free-standing, state of the art cancer treatment center, located on the NEA Baptist medical campus at 4800 E. Johnson. The only facility of its kind in Northeast Arkansas, the advanced center combines all components of cancer care under one roof, from diagnostics to chemotherapy treatments and radiation therapy to support and educational resources. We are dedicated to providing personalized, quality cancer care for our patients. The center offers 22 chemotherapy infusion suites, the newest technology in radiation therapy, a nurse navigator, HopeCircle – a program area that offers support, education and other resources for cancer patients and their families, a clinical research department dedicated to cancer research and a private garden for patient enjoyment and private reflection.